The project started with an older farm structure which Armstrong renovated as the two story home topped by the hipped roof (which has a faintly Japanese air to it). The one story addition faced with stone appears massive, archaic, and modern all at the same time. 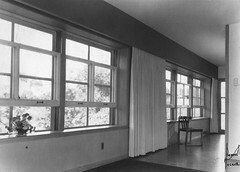 the three large square windows of the architectural studio are repeated in the house. In each case, no structural support is expressed, such as a lintel, header, or beams. The banding of brick at the left side of the studio windows connects the deep set doorway with the window openings suggesting continuity. The darkness of the bricks seems to fullfill a similar function to the black spandrel elements wrapping the corners of the house beyond. The stone wall is ultimately revealed to be a free-standing plane where a corner window without structural support turns the corner toward the white stucco garage. The massive stone planter stops the strong linear orientation of the sidewalk which offers access to both the architectural studio (first) and to the home (around the far end of the wall). The gravel driveway is divided by the massive planter at the corner into the portion at left, accessing the rear facing garage doors, and the small parking area, presumably for clients of the architect. The design makes effective use of tones and textures from the white of the stucco to the grey of the limestone, darker tones and shadows at the bricks, and darkest in the repeated composition of three square windows. While the stone face of addition partially concealled by vines and planting appears to be old, the white stucco of the garage extending beyond the end together with the flat roof of the addition, is a clear indication of its modernity. Armstrong has developed his architectural expression by the careful juxtaposition of materials, forms, geometry, and textures. All of this is set off by the dark landscape planting: vines, shrubs, perennials, and trees. The plants simultaneously break down the architectural forms softening their edges and clearly defined spatial boundaries. At the same time, the landscaping provides continuity among the various forms and materials employed in the exterior expression of the house. Overhang at entry to home. This version of the entry was taken several years later, perhaps as many as eight to ten years following the initial construction in 1938. The vines and plantings have grown in a great deal. 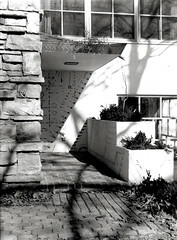 This view reveals more of the southeast corner of the house where the corner windows and interior planter are located. A black spandrel panel wrapping the corner links the windows on each face of the house to provide the appearance of continuity around the corner, despite the economic and structural need for structural support at these locations. Corner planter with glass table. 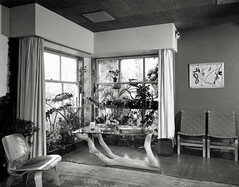 This photograph of the plant corner in the Living Room appears to have been taken in the later 1940s. It features the glass table Armstrong created from a part of a fallen tree found near his country house in De Soto, Missouri called the Rockpile. Armstrong took the tree branch and cut it to create a stable base with three rising supports for an irregularly shaped glass table top. The table design seems indebted to Isamu Noguchi's biomorphic glass coffee table with three supports recently introduced by Herman Miller. 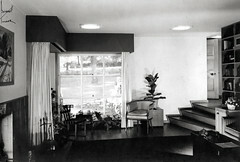 At left, the wooden Eames chair, also a Herman Miller product, seems to reinforce this connection. This photograph appears to have been taken following World War II. It seems likely that it documents the arrangement in the period following Armstrong's collaboration with Noguchi and Eames on the Magic Chef Building for the American Stove Company (1946). Windows along north wall open. Two sets of double hung square windows are located on the north side of the house. By repeating the window pattern and creating one continuous curtain and valance, this architectural feature helps to open up the space dramatically, connecting the Dining Room (near) and the Living Room (beyond). The double hung windows are particularly useful for ventilation. As shown here, the upper sash can be pulled down to allow hotter air to escape. When the lower sash is raised it creates a natural convection and help to bring fresh air into the house without any need for mechanical equipment, fans, ductwork, etc. Fry Residence -- axonometric view. This house design is a unique amalgamation of architectural forms and concepts. The initial impression is of a Wrightian prairie house with its cruciform organization extending from a central masonry chimney. The hipped roofs and continuous, wide overhangs contribute a great deal to this impression, particularly because of the way in which it shapes the house's silhouette. 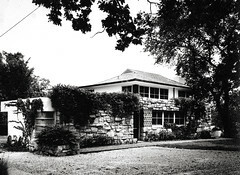 This image of a prairie house, however, is elevated to the second level above a rectilinear structure which presents itself as having flat roofs and horizontal strip windows more akin to the International Style than the Arts and Crafts source of Wright's early residential works. This axonometric drawing in black and white with darkened glazing graphically gives the house more of a Corbusian appearance than the actual house projects. The axonometric method of presentation used in depicting three-dimensional forms is an abstract, analytical approach. Frank Lloyd Wright would not typically use this approach, rather he preferred to present his work using perspective, where parallel lines recede to vanishing points, giving an image more akin to actual visual perception. The axonometric approach maintains all parallel lines as parallell and measurable. Nothing recedes into the distance and the building is presented more as a free-standing, man-made object as opposed to the more naturalistic, perceptual image presented by a perspective drawing. In particular, the drawing suggests plain white exterior surfaces, while the actual building materials were primarily brick and copper. 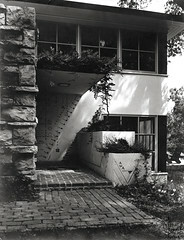 The built-in planters and climbing vines suggest Wright's work as a source, but these were features that Armstrong included in many of his works of various materials and forms. The site plan and siting of the house dictates the approach to the house. 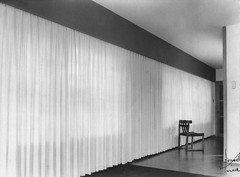 Initially, the visitor is faced with a blank brick wall relieved only by a planter at the far corner. The hedges surrounding the driveway are organized for privacy in additional to their function in directing vehicular circulation. The blank, simplicity of the garage volume acts as a foil for the house which presents a complex series of planes and openings, all oriented for horizontall emphasis, except the large vertical glazing at the main entry at the inside corner of the "L".